The alarm clock goes off – time to arise and take care of all your daily responsibilities. You walk into your bathroom, passing your full-length mirror, and a glimpse of your body causes you to notice those irritating little bulges around your bra line or around your knees. Between work and scheduled events, your life has been so busy. You haven’t had time to deal with those unsightly bulges. Ready to make a change? Kybella is slowly becoming one of the most popular forms of fat-removal treatments in the United States. Kybella is an extremely safe, simple, and FDA-approved fat-removal treatment. It is typically put into a syringe and then injected directly into the target areas. While Kybella is primarily used for reducing double chins and contouring the jawline, it has also shown remarkable effects on treating bra line bulges and reducing inner knee fat. These areas frequently experience accumulations of stubborn fat. Kybella has numerous such off-label applications that only add to its growing popularity. Off-label applications do not mean unethical or dangerous uses – the product is approved by the FDA. But with “off-label” use, the company has not invested the millions of dollars required to get FDA approval for that particular application. Typically, there are many studies and case reports showing safe and effective results before Dr. Enzer will perform off-label procedures. Most cosmetic physicians today prescribe Kybella for off-label treatments, as it has been seen to be completely safe when used in these ways. Off-label applications of Kybella can be used to treat fat deposits in a number of locations. Kybella is composed of deoxycholic acid, which is a natural component in bile. Bile is used in the breaking down of fats in the human body, along with a number of other digestive functions. By injecting Kybella into troublesome fat deposits, doctors can easily break down the fat deposits in a harmless and quick manner. The entire procedure of getting a Kybella treatment takes about 20 to 30 minutes depending on the number of fat deposits the patient wants to target. Any minor swelling and bruising after the treatment is temporary and disappears within a few days. Under the right conditions, Kybella can be an excellent solution for excess fat. 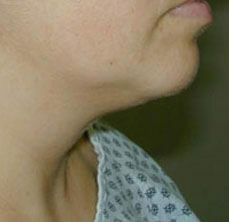 Kybella should never be used by pregnant women, as its effects on the fetus have not yet been studied. This injectable treatment should not be combined with other kinds of cosmetic surgeries. For example, if the patient wishes to ultimately go for a mastopexy or a breast augmentation with implants, then they must not combine them with a Kybella therapy. Before going for the treatment, you will need to meet with Dr. Enzer for a consultation to discuss any allergies you may have and any medications you are taking. Medications such as ibuprofen and acetaminophen are to be completely avoided before the treatment. You will also need to tell Dr. Enzer your complete medical history. Dr. Enzer may prescribe certain post-treatment lotions and medications to ensure quality Kybella results in the treated regions. If you’ve been unhappy with the appearance of bra line bulges and your inner knees, it’s time to make a positive change with the help of Kybella. Contact our office and set up an informative consultation with Dr. Yoash Enzer, a board-certified surgeon and Rhode Island’s top laser and cosmetic specialist. Kybella may be just the solution you’ve been hoping for.